Designer & Researcher - interested in all things influencing social, interaction & sustainable design. From fashion & textiles to systems & services. Dr Jen Ballie and Mark Shayler were invited by Zero Waste Scotland (ZWS) and the Scottish Textile and Leather Association (STLA) to design an interactive session within an event titled ‘Do Better Things: Do Things Better’. As designers and consumers alike, we can invest our energy, efforts and expertise into designing and doing good things. But will these actions have a true and meaningful impact within a world already proliferated with too much stuff? A recent BBC documentary titled ‘Hugh’s War on Waste’ highlighted that in the UK alone, we are disposing of seven tonnes of textile waste, every five minutes. Within many design disciplines there has over the last few decades been a lot of discussion about dematerialised consumption patterns; about shifting the focus in design from material possessions to accessibility and services. But why are there so few examples of organised service systems within fashion or textiles? Mark and Jen were challenged to deliver a hands-on, interactive workshop to re-imagine sustainability for textile and fashion businesses. Mark Shayler from This is Ape drew upon his notable expertise of working with big brands to share insights into how we might go about doing more, with less, to develop sustainable brand stories. He talked about the value of truly believing in what you do and mindfully shaped the morning session to provoke new thinking. During the afternoon, Jen expanded upon her PhD research to introduce service design as an approach for fashion and textiles. Within service design, touch points are used to craft a customer journey. The group explored what fashion and textile touch points could be and how they might be tailored to design alternative fashion experiences. The session concluded with everyone sharing a recipe card, a how-to guide for crafting a touch point, and these will be combined to curate the first chapter of an interactive toolkit. As designers, every decision we make has a profound impact on people and the environment and we need to better understand how garments live their lives with people. This year, the Edinburgh International Fashion Festival and Zero Waste Scotland worked in partnership, focusing on the issues of sustainability to help engage businesses and consumers with making fashion more ethical. I was invited to be a panelist within an event titled 'The Future of Fashion: Love, lease, lend' at the Dovecot Studios, Edinburgh. This particular session expanded upon Zero Waste Scotland's work aligned to the Circular Economy - where materials are kept in productive use for as long as possible, moving away from our current linear approaches to design, production and consumption. The panel was chaired by Mark Shayler, sustainable design consultant and co-founder of Howies Do Lectures. Mark highlighted that future of retail will change significantly, and he anticipates design will be led by China with production based in Africa. The internet has had a huge impact on retail and we need to re-think our current approach to design, production and manufacture. High street stores are frequently closing, so what does the future hold for our local high streets? From the perspective of the circular economy, what can we do in Scotland? Mark went on to share a personal challenge of giving up fashion consumption for one year and highlighted that he found it a lot less challenging than he had originally anticipated. 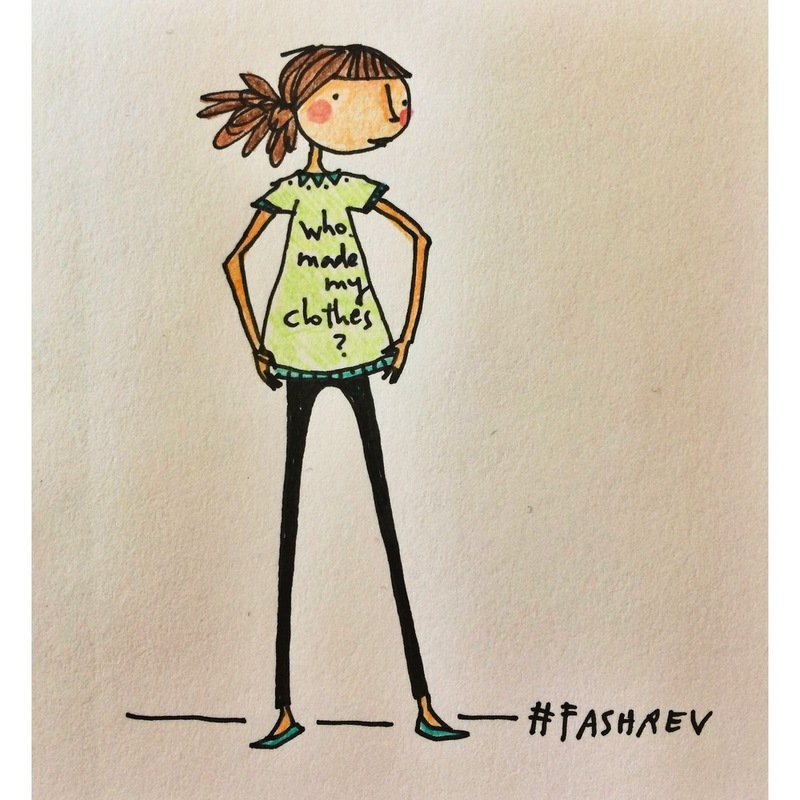 Prof Becky Earley has set herself a similar challenge this year #nonewclothes2015 and blogs about this frequently. The session opened with a presentation from Bert Van Son, founder of MUD Jeans one of the only fashion brands currently adopting a circular economy business model. Bert explained the philosophy behind the brand and their commitment to identifying a use for all waste within their supply chain. They have also use social media to capture stories from their customers using #mudstory. This was followed by a presentation from Claudia Domokos, co-founder of Rentez-Vous a luxury fashion leasing service with the tag line 'live fashion, don't own it'. Their online store has successfully launched in beta and they are capturing insights from customers, alongside building their portfolio of stock. Following these presentations, I joined Louise McGregor, Head of Circular Economy at Zero Waste Scotland and Michelle MacLeod, Marketing Manager at Ocean Terminal Shopping Centre. Zero Waste Scotland are playing a key role in supporting SME's to adopt circular economy concepts and included a Pop Up exhibition within the event to demonstrated new business models. Michelle highlighted how Ocean Terminal are beginning to experiment with new retail models by launching a micro-manufacturing makerspace titled 'the Facility Project' with a shop and studio capable of housing up to 23 creators and small businesses. The Facility will provide these creators with the space to work, access to a increasing number of textiles finishing equipment and the ability to sell directly to the public. There was a really positive atmosphere within the event and people were incredibly responsive to these new models and inquisitive to find out more. Following the panel discussion, people began to share stories of trekking charity shops, to gifting and repairing garments with their friends, demonstrating a desire to share and learn new skills. The BBC also produced a lovely stand along feature titled 'Recycling Drives Edinburgh Fashion Festival' view here. Sometimes it is the small changes that make a big difference. As designers, business owners, academics and consumers alike - we all need to be advocates of a more mindful and ethical approach to consumption. We need to practice what we preach, and it is only by challenging ourselves to become more resourceful, innovative and experimental with our own wardrobes that we can we truly learn. As consumers, we have the power to shift the narrative around fashion design, retail and consumption. Last month, I was invited by Amy at Zero Waste Scotland to contibute to a national campaign initiated by the Scottish Government to raise public awarness about the 'circular economy'. A concept exploring how to maximise the flow of materials in current circulation by indentifying opportuniites to sustain use, reuse and remake. I was asked to talk about mobile phone reuse, this is a key issue as we have more phones in the UK than people. I refered to google's Ara, a prototype modular phone, this project explores how key features could be reconfigured incrementally and personalised to the user. In addition to modular mobile phones the campaign promoted tool sharing libraries, leasing clothes, packaging from plants and 3D printing. Each apporach presents an exciting range of new opportunities for considerate material consumption and they can also be comibined. Further information can be found via the Zero Waste Scotland website. A few weeks ago on Friday 24th April 2015, I joined the Fashion Revolution! 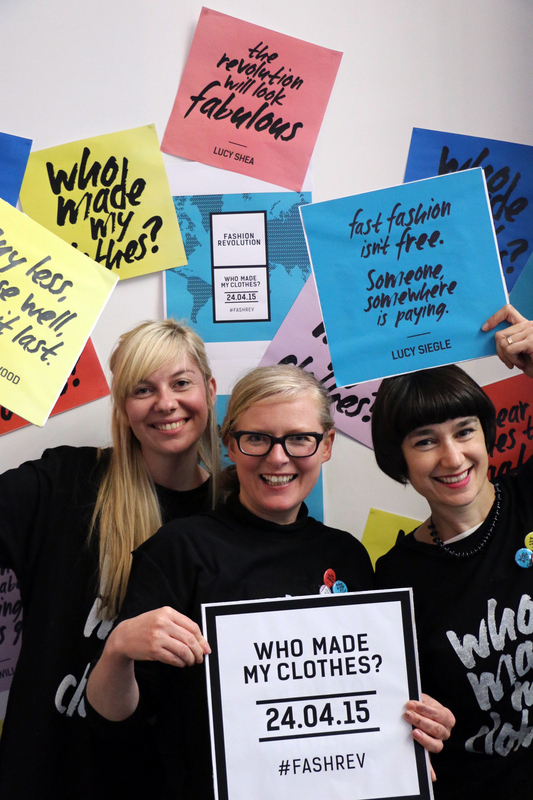 Thousands of people took to the Internet and to the streets to challenge the way the fashion industry currently works and ask #whomademyclothes. This year marked the second anniversary of the Rana Plaza disaster in Dhaka, Bangladesh, which killed 1133, and injured over 2500 people. The Fashion Revolution was initiated in 2013 by Carry Somers, Orsola DeCastro and Jocelyn Whipple , with the support of a global advisory committee of academics, designers and businesses leaders exploring sustainable fashion and textile design. "WE BELIEVE IN FASHION – AN INDUSTRY WHICH VALUES PEOPLE, THE ENVIRONMENT, CREATIVITY AND PROFITS IN EQUAL MEASURE, AND IT’S EVERYONE’S RESPONSIBILITY TO ENSURE THAT THIS HAPPENS." Fashion Revolution, 2015. We also hosted a master class demonstrating how to give back life to old clothes by successful costume designer and sewing teacher Iona Barker. 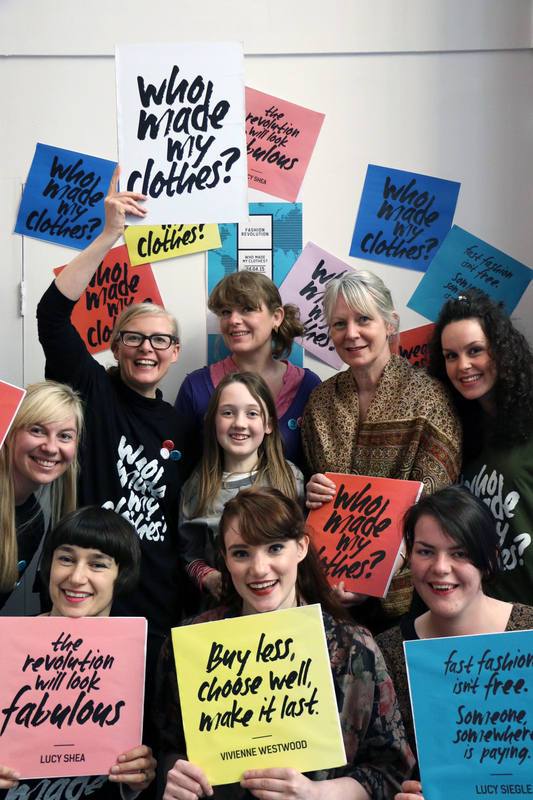 Visitors were invited to ask well known brands #whomademyclothes by sharing a selfie using social media via our Photo Booth that will include a ‘Fashion Tardis’ for styling and transforming your outfit ensemble before staring in your own photo shoot. During the afternoon we initiated a Fash Mob on Glasgow’s busy high street. As we marched through the high street, curious passers-by asked us questions. During the evening we hosted a film vert, curated by Annalisa. Ian Elder, Director at the Lighthouse, Glasgow and his wonderful team who provided tremendous support. Jenny Fraser , at the Glasgow School of Art, Glasgow for hosting the 'Film Vert' in the evening. Laura Kissel the Director of Cotton Road who allowed us to host a free screening of the movie. I am delighted to have an article included within the Journal of Design Strategies (Volume 7) which explores the concept of 'Alternative Fashion Systems'. You can access the full journal here. This blog documents thoughts, actions, personal reflections and collaborative endeavours.